Right click on an empty area on your desktop and navigate to new–>shortcut. 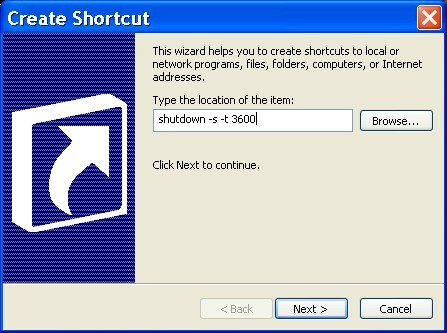 Now type shutdown -s -t 3600 in a box that says “Type the location of the shortcut”. Note: Here 3600 is the time in seconds after which the PC will Shutdown. So, 3600sec=60min*60sec. Click Next and type the name you want to give to the shortcut and click finish. Now if you want to abort the above activated timer, again create a new shortcut by following the first step and then type shutdown -a in the box that says “Type the location of the shortcut”. Click Next and the Finish. In this method you need to goto Start–>Run. 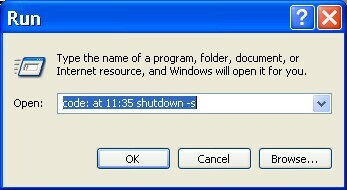 Now in the run command, type Code: at hh:mm shutdown -s where hh:mm is the time at which you want to shutdown your PC. For eg. : If you need to shutdown your PC at 14:30 hrs, you need to type Code: at 14:30 shutdown -s.
To abort the above timer goto Start–>Run and type Code:shutdown -a.